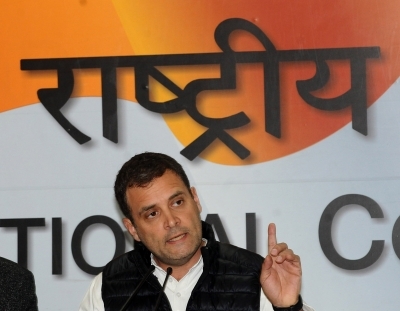 New Delhi, Feb 13 (IANS) Congress President Rahul Gandhi on Wednesday dismissed as "eyewash" the CAG report on the Rafale deal and contended that two major claims made by the government of cheaper deal and faster delivery of aircraft stood demolished because of the dissent report of three members of the Indian Negotiating Team (INT). Addressing the media after the CAG report was placed in Parliament, he referred to the views of the experts in INT on the Rafale deal and said "the two pillars of the Modi government's defence for the aircraft deal, of cheaper deal and faster delivery, stand demolished". "Experts who were part of the negotiating team have said Dassault Aviation (Rafale maker) has an order backlog of 83 aircraft and with a capacity of manufacturing only 11 aircraft per year it will take eight years to clear the backlog. "Thus, India will get its first Rafale much later than what was scheduled in the UPA deal. Not only that, they have also pointed out the final price offered by the French is 55.6 per cent higher than the benchmark price fixed by the negotiating team," Gandhi said. "Under the UPA deal, the India-specific enhancements along with transfer of technology was 11.11 million euro per aircraft whereas under the Modi deal the cost for the same, that too without transfer of technology, is 36.11 million euro per aircraft. This is where all the corruption has happened," alleged Gandhi. Reiterating his allegation of Modi's personal culpability in the deal, Gandhi said: "The Rafale issue has cut deep into the minds of the people, so much so that whenever someone says 'chowkidar,' the next words that follow are 'chor hai'. "From corruption to procedural violation to divulging defence secret to his cronies, Modi has done all in the deal and one by one all the defences by his government and his Ministers are getting demolished. "The fact that the first Rafale will come to India only after Dassault clears its backlog of 83 aircraft demolishes the Modi government's claims of sacrificing the UPA deal for the purpose of emergency purchase," Gandhi said.